On Friday evening, the University Feminist, Gender, and Sexuality Studies Program (FGSS) hosted its Fall Symposium on the topics of gender, race, police violence, and the #sayhername movement. The two speakers invited were Soros Justice Fellow Andrea Ritchie, a co-author of “Say Her Name” and “Queer (In)Justice,” and Sherri Williams, a media scholar and journalist who is involved in the #sayhername movement. After both speakers, there was a question and answer panel moderated by Visiting Assistant Professor of FGSS Elizabeth Garcia. Ritchie spoke at the event amid controversy concerning her involvement with Streetwise and Safe, an non-governmental organization that she is no longer a part of. Before her talk, Ritchie also mentioned the controversy regarding her work at Streetwise and Safe, with which she is no longer affiliated. She stated, however, that she would be willing to discuss the issue, which concerns allegations of worker exploitation at the organization, after the event. In a Facebook post. Mitchyll Mora, who used to work at Streetwise and Safe, detailed the exploitation that they and others allegedly experienced at Ritchie’s hands. Mora states that Ritchie lied to them and other LGBTQ youth of color, telling them that wages they were paid were the same, under the idea that everyone’s contributions were valuable. However, Ritchie was allegedly paid five to 15 dollars an hour more than youth staff, and collecting litigation fees. In emails exchanged between a group of concerned students at the University to the FGSS department and to Ritchie, the students questioned the department’s insistence on Ritchie’s participation in the event. However, the concerned students did not want to take away from the issues introduced at the event by bringing up the controversy. “In the future, we hope the FGSS department will consider inviting individuals who are engaged in ethical activist work on the ground, and whose work is not typically recognized, and who are generally denied access to elite platforms, like that of this institution,” the email reads. Victoria Pitts-Taylor, Chair and Professor of FGSS, Science in Society, and Sociology, began by introducing both speakers and stating that given the results of the election, the topic is now even more urgent. “It doesn’t matter to me whether you’re here specifically to mourn the deaths of black women and gender-non conforming people by the hands of the police, or whether you’ve decided to come to make your voices known about labor inequality and activist organizations, or both,” Pitts-Taylor said. Despite differences in views, Pitts-Taylor emphasized working together to sustain each other. Ritchie began by introducing her life’s work. Her presentation was entitled “Invisible No More: Racial Profiling and Police Brutality.” She structured her presentation in a series of questions, measuring the audience’s already established ideas on police brutality. She mentioned specific women targeted by the violence, and examined the reasoning behind why many people in the audience had not heard of their names before. She mentioned one case in which a pregnant woman was targeted and punched by a police officer, but the brutality did not spark any rebellion. She also explained the ways in which women and gender non-conforming people are targeted for their ethnic identities. “Arab, Muslim, and South Asian women have been targets of state violence throughout U.S. history, but particularly since 9/11,” she said. She said that racial profiling affects women more than what is generally known or presented in the media. “In fact, in Ferguson, Missouri, the year before [and where] Michael Brown was killed, the group subjected to the most number of traffic stops were black women,” Ritchie said. Ritchie also talked about how condoms have become a tool in discriminating against women and gender non-conforming people. She described the case of one of her clients who went clubbing and decided to go to McDonald’s afterward, late at night. A police officer then searched her and found nine condoms in her purse, which was linked to intent to engage in prostitution. “[They are] literally reaching into your purse and taking the one form of contraception that you can get even if you are not a citizen, without a doctor, or without a prescription,” she said. Williams spoke next and covered how black women are depicted in the media. She spoke on the invisibility and hypervisibility of black women in the media. She stated that black women are not seen as humans by the media, as cases of violence toward black women do not receive media attention like cases of violence toward black men. She discussed the concept of Missing White Woman Syndrome, in which the stories of missing white women garnered more media attention than missing black women. As a result, stories of white women are introduced into popular culture and into Lifetime movies that keep their stories in media attention. Social media has provided a platform for the stories of black women to move to and has allowed them to create their own news media channels. “For some people the only way they come into contact with these names is with the digital activism of the African-American policy forum,” she said, mentioning the work of one such online forum to spread the word of violence against these groups. This need also led to the Say Her Name report, which shared the stories of women whose names were unknown. As one of the largest issues facing the world today, violence against women and non-gender-conforming bodies is not given enough coverage in mainstream media. Williams offered her perspective based on her personal experiences of working in the media industry. 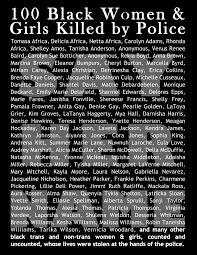 Say Her Name aims to make the violence perpetrated against black women more visible. This article has been edited to reflect the actual allegations against Ritchie, which is that she received $5 to $15 more than youth staff per hour, rather than on top of a full-time salary, which she did not receive until her final year at Streetwise and Safe.